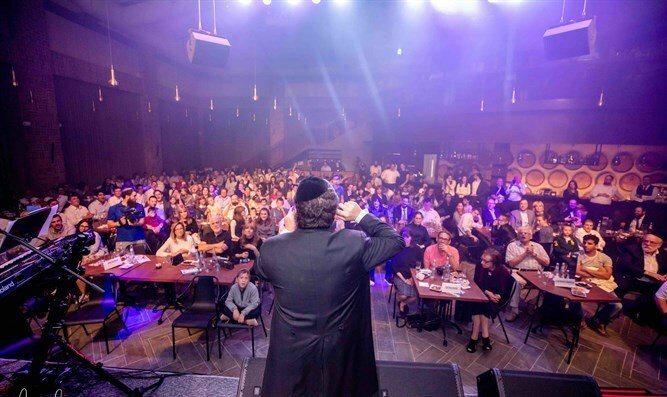 Hassidic singing duo holds special performance in a vineyard, to help children with special needs, . The hassidic singing duo Benny Friedman and Ohad Moskowitz on Sunday held a special performance in a vineyard, to help children with special needs. During the show, the two sang a premiere performance of ‘Tanya-Adrebe’, a mashup combining the two well-known hassidic hits, composed by Yossi Green. More than 400 people attended the special performance, including donors and supporters from the US and Europe to the ‘Sulam’ NGO for special-needs children. The donors are spending Sukkot in Yerushalayim and the performance was held at the Barkan Wineries. It was organized by "Fleishman & Peles Productions". During the show, which included known hits such as “Ivry Anochy,” “Yesh Tikva,” “Lamelech,” “Birkat Habanim” and others, one of the children from ‘Sulam,’ who until recently could not communicate with her surroundings at all, showed the audience how today she can communicate with her environment via an iPad, enabling her to attend a regular kindergarten beginning next year. Esther Ernster, CEO of Sulam, told the donors how more than 600 employees of the organization operate 15 educational centers where hundreds of children are educated and how this has been continuing for more than 36 years. Sulam also accompanies the parents of the children, who encounter great difficulties in the face of their children’s disabilities."